Composer. Nationality: American. Born: Providence, Rhode Island, 13 April 1942. Family: Married Shelby Cox; children: Rachela, Nicola. Education: Louisiana State University, B.A. in piano and composition, 1964; Juilliard School of Music, M.A., 1967. Career: Was a piano prodigy as a child; organized his own band, 1957; scored his first films in Italy while traveling with a jazz combo, late 1960s; composed original music for many TV series and mini-series, most notably Dynasty, Falcon Crest, Cagney & Lacey, Lifestyles of the Rich and Famous, The Colbys , American Gladiators , North and South, North and South II , and Napoleon and Josephine: A Love Story , 1976–89; his recording of "Gonna Fly Now" (the theme from Rocky ) became a number one pop music hit, 1977; began stint as Music Director of yearly Academy Awards ceremony, 1970s. Awards: Best Original Score Academy Award, for The Right Stuff , 1984; ASCAP Film and Television Music Award for Primetime Live , 1989; Emmy Award for Outstanding Achievement in Music Direction, for The 64th Academy Awards , 1992; ASCAP Golden Soundtrack Award for Lifetime Achievement, 1995. Agent: Kraft-Benjamin Agency, 8491 West Sunset Blvd., Suite 492, West Hollywood, CA 90069–1911, U.S.A.
"A Few Easy Pieces: Interviews with Composers Bill Conti and Jerry Goldsmith," interview in Millimeter (New York), April 1979. "Working Abroad: Two Composers," interview with D. Koeser, in Cinema Papers (North Melbourne, Australia), February/March 1985. "Bill Conti," interview with S. Simak, in CinemaScore (Sunnyvale, California), Summer 1987. "A Conversation with Bill Conti," interview with D. Cavanagh and P.A. Maclean, in Soundtrack! The Collector's Quarterly (Belgium), September 1992. Barbano, N., "Musik," in Kosmorama (Copenhagen), September 1980. Santiago, T., "A Film Music Seminar," in Soundtrack! The Collector's Quarterly (Belgium), March 1984. Feldman, G., "Filmusic: Bill Conti," in American Premiere (Beverly Hills, California), no. 2, 1985. Scott, V., "Scrapbook: Conti Scores Catchy Themes," in Soundtrack! The Collector's Quarterly (Belgium), June 1985. Lehti, S., "'The Right Stuff '/' North and South' /Bill Conti," in Soundtrack! The Collector's Quarterly (Belgium), December 1986. Pecqueriaux, J. and others, "Bill Conti-Filmography/Discography," in Soundtrack! The Collector's Quarterly (Belgium), December 1986. Darnton, Nina, "At the Movies," in New York Times , 22 May 1987. Tucker, G.M., "Bill Conti's ' Neighbors '/The Undiscovered Score," in CinemaScore (Sunnyvale, California), Summer 1987. Silverman, M.S., "Organizers of Oscar Telecast Plan a Few Changes This Year," in Variety (New York), 10 February 1988. Blocker, S., "Conti Doesn't Write Music for Prosperity," in Wisconsin Journal , 22 January 1995. 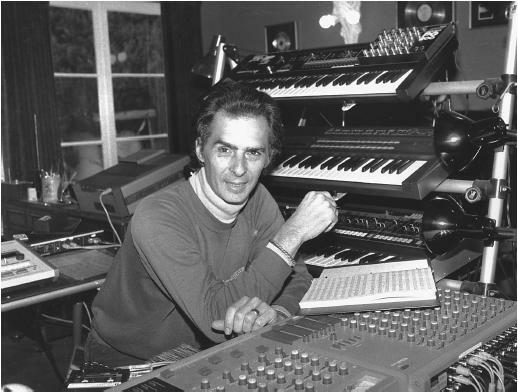 Bill Conti is a prolific, all-purpose composer-arranger who in his thirty-plus year career has written musical themes for every conceivable medium and genre: blockbuster and B-list Hollywood action-adventures and comedies; television series and mini-series; independent and foreign-language productions; and even television commercials, specials, and news and variety programs. In 1987, for example, he composed the music for such diverse films as Broadcast News and Masters of the Universe , Baby Boom and A Prayer for the Dying —not to mention the Italian-made Io e Papa , the television series Ohara and Mariah , and the mini-series Napoleon and Josephine: A Love Story. Early in his career Conti found himself in Italy, where he scored one prestigious film, Vittorio De Sica's Il Giardino dei Finzi-Continis. He began composing scores and themes for long-forgotten television series and made-for-TV movies and worked with Paul Mazursky, writing music for Blume in Love, Harry and Tonto , and Next Stop, Greenwich Village. Yet in the mid-1970s, Conti still was relatively unheralded. Then he won the assignment that would establish him as one of the most celebrated composers of his era. He was hired to write the music for an obscure, low-budget feature about a club fighter who gets the opportunity to tangle in the ring with the World Heavyweight Champion. The star and screenwriter was an unsung actor named Sylvester Stallone. The film was Rocky , and Conti's rousing, inspirational theme song, "Gonna Fly Now," was an immediate audience-grabber. Along with Vangellis's Chariots of Fire theme and Randy Newman's music for The Natural , "Gonna Fly Now" remains among the most familiar and beloved sports-oriented movie themes. Musically-speaking, Conti's overall score is neither complex nor creative, but it is undeniably effective in imparting a mood of self-confidence and triumph. Conti's music for Rocky transcends the motion picture medium—and not just because, back in 1977, "Gonna Fly Now" reached number one on the pop music charts. In subsequent years, the song has come to symbolize the courage and spirit of the underdog. Decades after Rocky first came to movie theaters, one might attend an athletic event and find some scrappy, Rocky-like challengers entering the boxing ring or playing field to the soaring trumpet that opens "Gonna Fly Now." Given the phenomenal success of Rocky, it is no surprise that Conti went on to compose the theme music for the television series American Gladiators. In fact, quite a few of his future projects involved creating musical sounds to parallel the emotion inherent in athletic activity: Goldengirl ; Dreamer ; The Terry Fox Story ; The Karate Kid and its sequels; Rookie of the Year ; The Scout ; Necessary Roughness. One of Conti's very best scores, for The Right Stuff , amplifies the heroics of pioneer American astronauts. The names of the themes on the soundtrack—including "Breaking the Sound Barrier," "Yeager's Triumph," "A Close Call," "Returning Home," "Last Embrace," and "Final Meeting"—mirror the composer's approach to conveying the tension and emotion of the story. Across the decades, Conti has maintained professional relationships with his Rocky co-workers. Immediately following the film's success, he composed for projects that were outgrowths of Rocky : Slow Dancing in the Big City (a Rocky clone helmed by its director, John G. Avildsen); Paradise Alley (directed and scripted by and starring Sylvester Stallone); Uncle Joe Shannon (scripted by and starring Rocky supporting actor Burt Young); F.I.S.T. and Victory (both starring Stallone)—and, of course, the inevitable Rocky sequels. In particular, Conti has remained Avildsen's house composer, scoring a majority of the filmmaker's projects well into the 1990s. As a composer working in a commercial medium, Conti is as pragmatic as he is prolific. He accepts the reality that his role as composer is to serve his director. If the filmmaker is not musically oriented, Conti will relish the resulting artistic freedom. However, if the filmmaker knows exactly what he wants for the soundtrack, Conti will provide those sounds. He understands that movie music primarily must be emotional; it is one of the components that keeps the viewer involved in the on-screen activity. For Conti, composing ultimately is a job. Upon completing work on one project, which may be a much-hyped potential blockbuster or Oscar contender, he will dutifully move on to the next, which might be an obscure television show or made-for-TV movie. Comden, Betty, and Adolph Green Cooper, Merian C.